Salad is not rabbit food. The green leafy matter which may be added to your plate and often abandoned is not just for decorative purposes – it is both edible, and good for you ;o) I am really, quite the fan. To anyone who doesn’t like tuna, anchovies or capers – read on – this is not for you. For those who do, I really think this is a really tasty main meal (yes, it is a salad!) and will not have you crying out for more substance- this is really filling. There are many iterations of this dish – this is my non-classical interpretation. I first made this for my friend Maya back in 2009 (how time flies) and I think it works just fine the way it is. There are quite a few components to this dish, however none are at all onerous or complicated. I will try my best to detail what you need to do. Put eggs in a medium pan, cover with cold water and bring to the boil. Once boiling, reduce the heat and cook for 5-6 mins, Drain water with lid, cover with cold water, drain again and repeat. The purpose is to cool down the eggs as quickly as possible so that they do not continue to cook. The aim here is for a medium hardness yolk. Cover again with cold water and set aside. Once cooled down, carefully shell the eggs and slice in half. In a separate pan, add boiling water, a pinch of salt, and add the green beans. Bring to the boil,then reduce and simmer for 3-4 mins. I like beans to be quite al dente vs soggy mush. Drain. In a bowl, combine the finely diced shallot, vinegar, olive oil, mustard, parsley and half of the capers and mix together with a bell whisk. season to taste. Remove about 1 x tbsp of the dressing, mix this with the warm beans you have just drained and allow to cool. Combine the sweetcorn (drained) and tuna with the remaining dressing and mix well. Season again and set aside. Slice the red bell pepper into strips. take a large dish, and layer the base with salad leaves. Add the cooked beans, and red pepper making sure that they are evenly spread out. Drizzle any remaining dressing form the beans over the salad base. Arrange the eggs evenly so that the middle is facing you. Scoop out the tuna and sweetcorn mixture, and make into 4 x even sized mounds. Any leftovers can be made into a great filling for a sandwich or pitta bread. 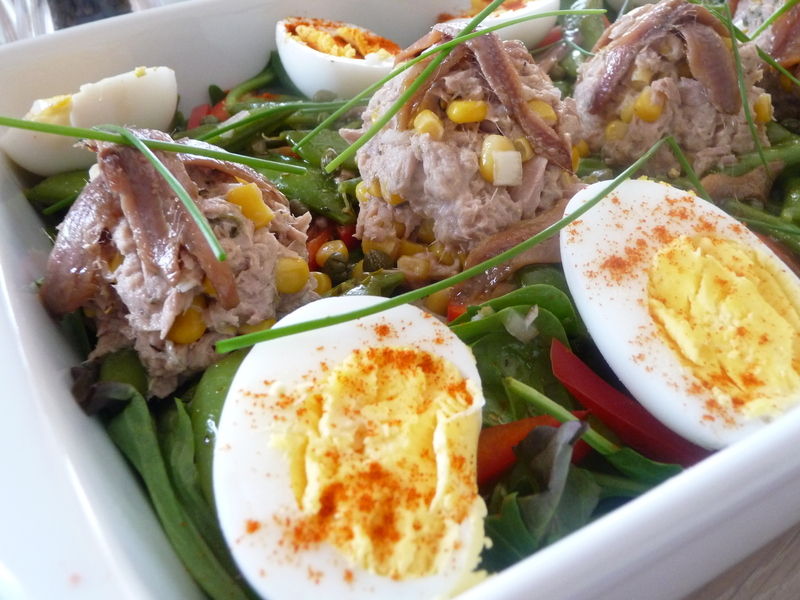 Divide the anchovies and lay over the tuna and sweetcorn mounds, and arrange in a '+' formation. Finally, sprinkle over remaining capers, dust the egg yolk with cayenne pepper, and add chives to garish.